This was a multiprocessing slave board with a 4 or 6MHZ Z80 CPU. The board (a bus slave) was completely self contained just using the bus for power and to communicate with the bus master via I/O ports. The SBC-1 was a single board computer designed to be implemented in a high-performance multiprocessor system. The SBC-I allowed the systems in­tegrator to provide each user with his/her own CPU, 128k of segmented memory, two serial ports, and two parallel ports. Because each user had his own CPU, the addition of other users to the system caused far less speed degradation than was currently available with "time-sharing" multi-user systems. The SBC-I used the high powered Z-80A or Z-80B CPU from Zilog. CPU speed on board the SBC-I was independent of the S-100 bus system clock; therefore, the ability to run a 4MHz SBC-I in a 6MHz S-100 system allowed the systems integrator to optimize the efficiency and the cost effectiveness of his system design. 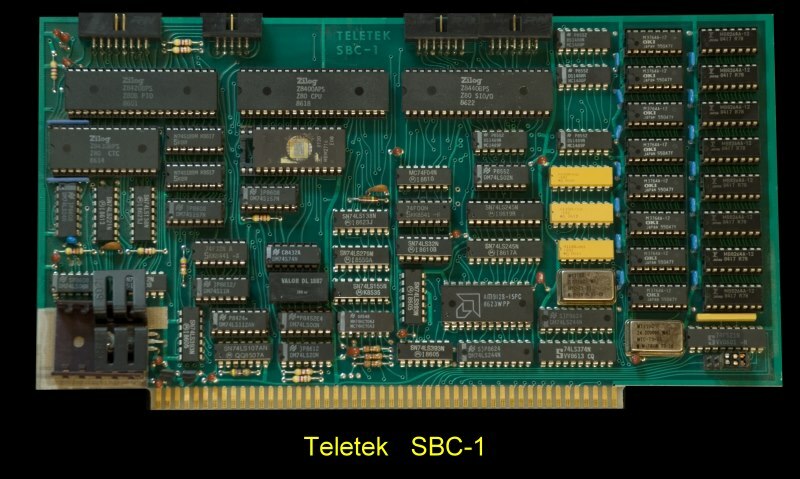 Each SBC-I had 128k of RAM on board which incorporated a memory management circuit that allowed virtual memory operation. The circuit partitioned the RAM into 4k segments that could be dynamically addressed on any 4k boundary of the CPU address space. This allowed ultimate flexibility in the implementation of operating systems and applications software. In addition to RAM. there was 2k, 4k, or 8k of EPROM available for initialization routines. After the routines have been completed, the EPROM could be disabled by software. An option was available that allowed the use of the extra memory provided on SBC-I as a local disk drive. Because this local drive was in reality a bank of semiconductor RAM, it was many times faster than the system floppy disk drives. This RAM drive was called the "M" drive and it could be used like any other CP/M supported drive unit. Files could be loaded on the M drive using the CP/M PIP command. There is a total storage unfortunately was only 59k bytes ! A Zilog SIO provided two independent serial ports with software selectable speeds. A Zilog CTC provided the clock signals to the SIO. There also were two additional counter/timer outputs available to the user at his option. Both serial ports provided RS-232C interface capability for easy local interconnection at speeds up to 19,200 baud. The baud-rate clock is supplied by a 2,4576MHz oscillator. In addition, there were provisions for allowing a synchronous MODEM to connect to one serial port. A Zilog PIO provided two parallel ports for use in interfacing parallel devices. One port was bidirectional and the other provides control lines (some of which are used internally). An adaptor board was available that converted the parallel ports to an RS-422 compatible interface. The RS-422 port provided high speed (up to 154k baud) long distance (4,000 feet) communications ability. The bus interface was fully IEEE-696 S-100 compatible. The SBC-I appeared as a slave on the S-100 bus and communication to the system is via a 1k byte or 2k byte FIFO interface. Therefore, the SBC-I appeared in the system as a set of I/O ports. There are three levels of reset capability in the system utilizing the SBC-I. The first was the traditional hardware system reset in which all components of the system are reset. The second level of reset ability was when the user resets only his SBC-I leaving other slaves and the bus master undisturbed. The third level of reset was an individual software reset available for each SBC-I on the bus. This allowed the bus master to reset any one SBC-I without affecting other users. The capability of the SBC-I was not limited to the S-100 bus. With appropriate interfacing the SBC-I could operated as a stand-alone network user node. Communications to other network nodes could be implemented on RS-232, RS-422, or through the FIFO interface. The brochure for this board can be obtained here. The manual for the board can be obtained here.